SANDAG has less money than it expected, and the transportation projects it’s built are more expensive than it had hoped. Now, an audit says the agency needs to start making tough decisions. The San Diego Association of Governments needs to sort out how to deal with its financially troubled infrastructure improvement program, including deciding which highway expansions or transit improvements will get canceled, delayed or scaled down, according to a recent audit of the program. With the audit, financial problems facing TransNet, the voter-approved sales tax for regional transportation needs, are coming into focus. A year of scandal led to the ouster last year of SANDAG’s longtime executive director, after the agency failed to disclose it was bringing in less money than expected through TransNet, and that the projects it built had cost far more than expected. State legislation reshaped the agency. Last year, SANDAG released its outline for how it could complete all the projects promised to voters in 2004 before the program ends in 2048. That outline demonstrated the financial uncertainty TransNet faces. But an audit released in June by a TransNet oversight committee is further clarifying the tough decisions facing the agency’s troubled program. The audit concludes that paying off the debt the agency took on could require using money that was intended to pay for more public improvements, and found that the money the tax generates to run bus and train routes is now not expected to be enough to cover everything. In 2015, SANDAG said it was expecting to bring in $10 billion in grants from the state and federal governments over the life of TransNet to help build everything it promised voters. That’s money the agency wins through competitive grants to cover part of major projects, helping it stretch the money it collects locally. Last year, SANDAG increased the amount it expected to win from out of town to $18 billion, nearly double its forecast from just two years earlier. The reason the number grew so much is simple: It had to. Once SANDAG updated its long-term outline with new, lower sales tax estimates and new, higher cost estimates, it created a gaping hole in TransNet’s budget. SANDAG filled the hole by assuming the state and feds would fill it. Money from outside the county was always expected to be part of the program. On the ballot, SANDAG promised to bring in $1 from outside San Diego for every $1 it collected locally. But now, to build everything it’s promised, it needs to bring in $3.40 for every $1 in sales taxes. That’s what the $18 billion need translates to. SANDAG has said this is possible, although it has acknowledged that it has never done so well in its history. Still, the agency emphasizes that since 1988, when the initial TransNet ordinance passed, it has brought in $3 for every $1 of local tax money. So while it will need an historic performance, the agency argues it’s only 13 percent better than its previous performance. Last year, SANDAG said this could happen – if the gas tax survives the November ballot, and the state or federal governments pass two more programs comparable to it in the next 12 years. In other words – the auditors argue there’s a good chance SANDAG won’t make good on its promises to voters, and the agency should start drawing up contingency plans. “If revenues are insufficient to deliver the major corridor projects by 2048, SANDAG may have to re-examine priorities and make decisions on whether to delay projects beyond 2048, reduce project scope, or eliminate projects,” the audit reads. SANDAG hasn’t started projects including expansions to portions of I-5, I-805, SR 94 and SR 56, and has projects in the early phases that include adding a second track to portions of the Coaster rail line. In an email, SANDAG spokeswoman Jessica Gonzalez argued SANDAG brought in fewer state and federal dollars compared with its own tax collections over the last 15 years because projects weren’t in the construction phase, where they typically win matching grants, in the early years of the TransNet extension. Coronado Mayor and SANDAG board member Richard Bailey, who has become a vocal critic of SANDAG’s handling of TransNet’s financial problems, went a step further. “The likelihood of building all the major corridor projects by 2048 is almost nonexistent,” he said. The audit says the agency’s outline for financing all the TransNet projects is “an effective short-range planning tool for managing financial capacity for projects,” but said the agency needs to start looking at how it will handle the final 10 to 20 years of the program and figure out how it will cancel, delay or worsen projects based on funding constraints, and start regularly revisiting those plans immediately. Bailey said the reality is setting in with the board that it’ll have to start setting priorities for the projects that remain, since it’s unlikely it’ll be able to build everything. He said the language staff uses when it talks to the board has changed. When voters approved the extension of the TransNet tax, SANDAG took out a lot of debt, promising to repay it with future tax collections. That allowed the agency to start building projects right away. It also allowed it to take advantage of lower construction costs during the recession. The agency will spend about $100 million a year through 2025 paying off that debt. During that time, virtually all the money in the tax that was meant to build big regional transportation projects will go to paying off the debt. In a few years, SANDAG won’t have any of the money it borrowed left. After that, it will have to save up tax collections until it has enough for big projects. But now that the agency has acknowledged its diminished revenue expectations, it could run into some problems if there’s another recession. The agency’s current forecast anticipates it’ll collect enough money to pay off its debts and still have a positive cash flow – allowing it to save up money for future projects. Revenues need to grow by nearly 3 percent per year to cover SANDAG’s debt obligations by 2026. TransNet revenue growth hit that mark from 2001 through 2009, but not from 2010 through 2017. 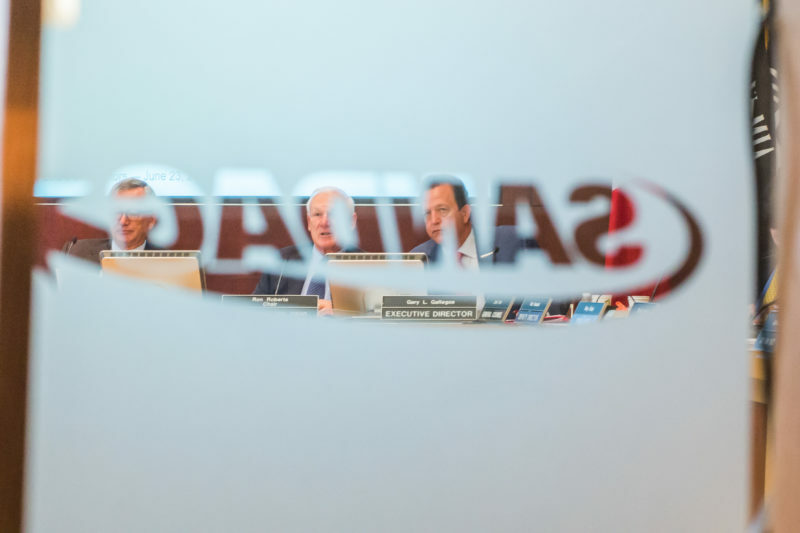 “If there were to be another period of significant economic recession or stagnation, revenues could fail to grow at a rate which would allow SANDAG to meet debt obligations for the major corridors while maintaining a positive annual cash flow,” the audit reads. In that case, SANDAG would still be able to pay back Wall Street investors for the money it borrowed. It would just have to divert that money from other parts of the TransNet program, like the pots of money that currently go to individual cities for street repair or the money that goes to transit operators to run bus routes. Gonzalez said the agency also has unspent cash meant for major corridors projects it could use if revenues fall below the agency’s annual debt obligations. Investors are going to get paid; SANDAG’s remaining TransNet obligations will be left competing for the money that remains. One of TransNet’s less discussed elements is the money it gives to the Metropolitan Transit System and North County Transit District each year to cover the costs of running the transit services built under the program. Specifically, it gives 8.1 percent of all the money it collects to cover costs on 10 transit projects, including already-operating services like the SuperLoop bus in the UTC area and the Mid-City Rapid bus, and under-construction projects like the Mid-Coast Trolley line and the South Bay BRT. The audit shows SANDAG currently plans to spend more money on transit operations than it expects to collect. Since the program started, SANDAG has collected roughly $200 million for transit operations. Because it started collecting money before it built the stuff the money was meant for, it’s built up a healthy reserve. It’s got about $150 million on hand, waiting to be spent. And it’ll need that reserve, because SANDAG currently expects to spend more than it brings in each year beginning in 2022, when some under-construction transit projects are operational. But those annual deficits eventually give way to an overall shortfall, with SANDAG looking at spending $82 million more on transit services over the next 30 years than it expects to bring in. Plus, the audit argued that the plan, even with its shortfall, relied on an “overly optimistic” expectation for how much of the transit costs would be covered directly by rider fares. “Decision-makers will want to act ahead of any cash flow and funding challenges, especially to prevent service reductions if revenues cannot keep pace with costs for new services as well as existing services,” the audit reads. SANDAG’s transportation committee discussed the shortfall last month, with a staffer saying the agency is now focused only on operations funding for the seven projects that were completed or under construction, leaving the last three projects (frequency increases on the Blue Line, the Coaster and the Sprinter) in limbo. In an email, MTS spokesman Rob Schupp said the only MTS service that’s in jeopardy for now is the plan to run trains on the trolley’s Blue Line every 7.5 minutes outside of rush hour. “We’re taking a wait-and-see attitude to see if reality meets projections,” he said. At the SANDAG hearing, MTS Chairwoman Georgette Gomez was alarmed that Blue Line frequency increases are in danger. The trains are already packed, she said, and that’s before the line is extended all the way to UTC by the Mid-Coast project. “The fact of the matter is the need is there now,” she said. Of more immediate concern, Schupp said, is the potential repeal of the gas tax going before voters in November. Costs at MTS already exceed funding by $9 million, he said; if the gas tax increase survives November, the MTS board could use that money to plug its shortfall. “If repealed, and if ridership doesn’t increase substantially, we will have to look at other ways to balance the budget,” Schupp said.